The VW Up(!) is Volkswagen’s adorable little compact car that we don’t get in the United States because life is unfair and cruel. VW decided to spice up the Up a bit by adding a GTI trim. Just look at it. It’s like a tiny Golf GTI. According to a report by Carscoops, the Up GTI is powered by a 1-liter inline-three with a lil’ turbo that makes 113 tiny horsepower and 170 lbs-ft of torque. That’s a fair bit for such a small car. I’m not sure I can wait until the year 2043 to import one. I need that mini-Golf now. 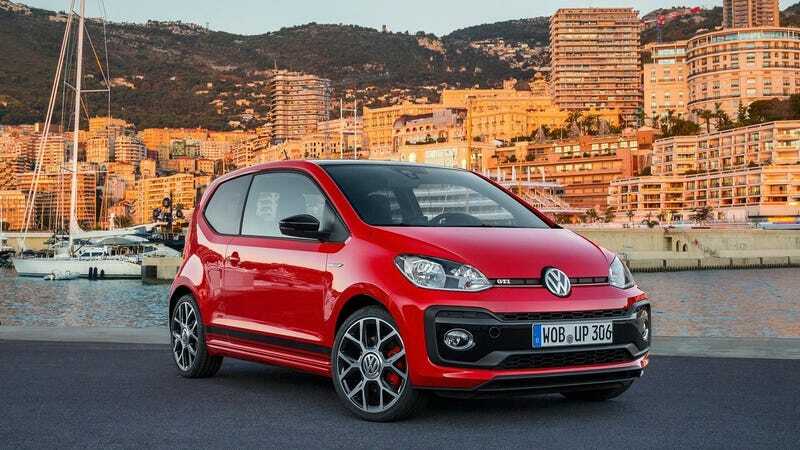 The 0-60mph time is 8.8 seconds and the Up GTI has a top speed of 122 mph. That’s not bad considering that you can probably fit the Up inside a large backpack. Carscoops noted that it harkens back to the original Golf GTI from decades ago and I agree. It has a cool old Euro-hatch charm to it that I am having trouble getting over. Someone needs to petition VW to send the Up GTI overseas to the United States. The closest thing we get here is the Fiat 500 Abarth and that’s not good enough.